Today's post is showing you how easy it is to make your own safety pin brooches. My dear friend from www.Mariampoppins.com recently made some of these which then inspired me to have a go too! Below is a photograph of the ones that she made - she also sells them online too! 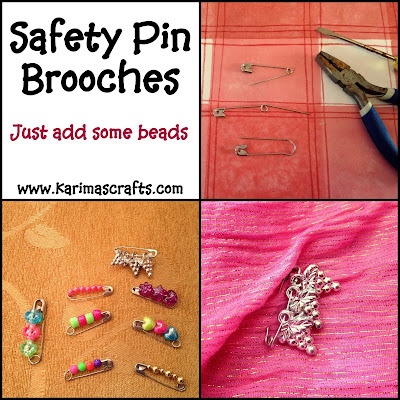 Step 1: Unravel the safety pin using pliers or something else suitable - so that the beads can slot on easily. Step 2: Place beads on to the pin. Step 3: Then wrap the metal around something using pliers to try to reform back into the original shape as best you can! That is it - so simple - the ones in my photograph were all made by myself with the help of my 6 year old daughter as the main designer! Oh these are so cute! Something fun and simple for the kids to do!